Seeing as how so many farm teams piggyback on their parent club's moniker and come up short in the originality department, I'm glad I picked up this cap because this logo truly embodies the independent spirit that I appreciate so much in minor league baseball. It's always appreciated when the team logos can let go of the stuffiness and this Hillsboro Hops cap knows how to have "fun" while maintaining an air serious enough to let you know that they are gonna whup you on the baseball diamond. The main thing that I love about this logo is that it celebrates the Pacific Northwest's greatest export (craft beer) by featuring a smirking hop cone -who is also wearing the team's away cap, which is totally meta- against a backdrop of the mountains and trees thus honoring the region's natural beauty. In addition, the Hop's surly grimace captures the overall level of the baseball fandom exuded by Portland's dilettantes over the years. After doing a fair amount of research, I learned that there has never been an organized - professional, collegiate or amateur - team that has gone by the name of "Hops" before this one. I can appreciate this "first" as I am a fan of baseball, beer and originality and those are the first three things that come to mind when I think of Portland, Oregon. In 1903, the Portland Webfoots (who later became known as the Beavers) joined the Pacific Northwest baseball league and (except for a few seasons in the 1970's and 1990's) "The City of Roses" has consistently fielded a team ever since. The story of baseball in Portland is one for another time but the important takeaway for now is that after the 2010 season, the Portland Beavers were sold and moved to Tuscon. The team lasted there for three seasons and then moved to El Paso, Texas where they are now known as the (sighs) El Paso Chihuahuas. If you drink beer and don't know what it's made of, maybe the Hops' logo can help instruct you. The quick and dirty on beer is that it starts out as a strained soup (known as wort) made from barley which is flavored with hops which provide aroma, bitterness and overall character to the finished product. The addition of yeast begins the fermentation process that converts the wort's sugars into beer with alcohol. When the beer's aging process is complete you will have a tasty beverage to enjoy! Knowing what is in your beer is as important as being familiar with the history, players and rules of the baseball game that you enjoy at the ballpark. I hope this reasoning was the intent behind choosing "Hops" as the team's name but that probably wasn't the case. Those in charge probably wanted to capitalize on the craft beer boom that is currently leaving its mark all around the country and I don't see any harm in respecting Portland's contributions there. As always, I continue to struggle in deciphering the early origins of the minor league teams that I feature here. There is rarely such thing as a "new team" but rather what you'll find is a team will return to an area some years after the previous one left. 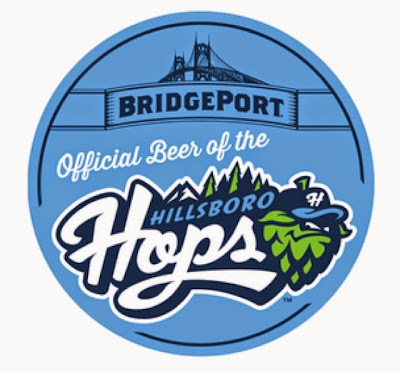 Even though Hillsboro is part of the Portland metropolitan area, the roots of the Hops lies in the teams that played in Oregon's capital city of Salem since 1940. While they were first known as the Senators, they were later called the Angels and then finally the Dodgers. In 1990 the team moved to Yakima, Washington and became the Yakima Bears. Because of this move, Salem was without a baseball team until the San Francisco Giants relocated their Northwest League team from Bellingham, Washington to Salem -well, Keizer technically- in 1997. That team is known as the Salem-Keizer Volcanoes (the fans voted on that name, by the way) and they appropriate their history from the clubs that played in Salem, as well as Bellingham. I hope you enjoyed reading about this great new team and getting a cursory glance at its history as well. For another great take on the Hillsboro Hops logo, here is a fun article discussing the Hillsboro Hops from a blog called Sportchange that I keep up with regularly. Also, here's a photo of the "Run Like an Antelope" pin that I wear on the cap sometimes!